March 20, 2012 / P.J. Darren receives his winnings from tournament director Bob Graham. Darren represented Rattling Chains well by winning Am 3. My only saving grace was not finishing last. It’s always been in my nature to be one. I dream of winning the lottery (and, of course, build some wonderful disc golf courses). I wonder what the world would have been like if I had been a professional baseball player. Or a pro athlete in general. I dream about great jobs and fancy cars. And floating down the river on a tube with no worries in the world. I also dream of the day that I can make every 10-foot putt, drive 350-plus feet and not have to play every tournament in the novice division. There’s a problem with being a dreamer, however. It really does slap you in the face. Often. And, unfortunately, reality has a firm grip on my disc golf game. I putted surprisingly decent, despite some of the baskets at Rutgers not being the most kind to golfers! There aren’t any courses in my area. If I want to get a round in, I have to travel about an hour and a half to get to a course. And because I have some other hobbies I do as well as play softball, doing field work can get tedious and boring at times because it’s the same thing over and over. If I could do field work and then play a round or three each week, I think it would be better. As it is now, I’ll hit up a field, mark out some distances and throw for a while. Then I’ll putt. I love doing that because it can be relaxing. But as I said, I get a little bored at times doing the same thing. I start dreaming of my other hobbies and go and do something else. I need to find a way to snap that funk. Maybe find a place to put my basket where there are trees and such to make it a little more interesting. I need to get better. That’s all part of this year’s goal — to become a 700-rated player. I know that’s not the most dynamic goal in the world in relation to disc golf. I started playing at the same time that my cohort in this blog — Darren — started. He’s already an 842-rated player and continually gets better. But he plays in leagues. He has a course close to him where he works. He’s got the options. I start the year at 672. I am still trying to fully understand ratings (I hope I’ll eventually have a story up here about them), but at first I didn’t think 672 to 700 would be that large of a jump. That was until one tournament last year when I thought I played decent and saw my rating drop. Striving for 700 was born. 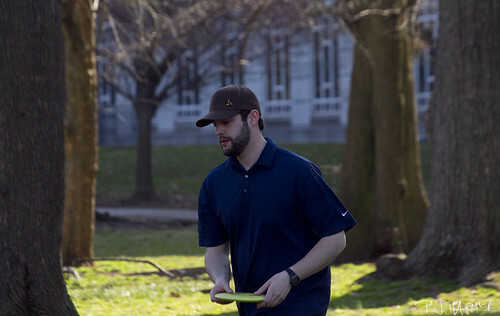 The first stop on the Striving for 700 Tour came this past weekend when I traveled to New Jersey to participate in The March of St. Pat’s Madness, a PDGA C-Tier event run by professional player Bob Graham. Alex, who was part of the first-round foursome I was with, placed second in Am 1. 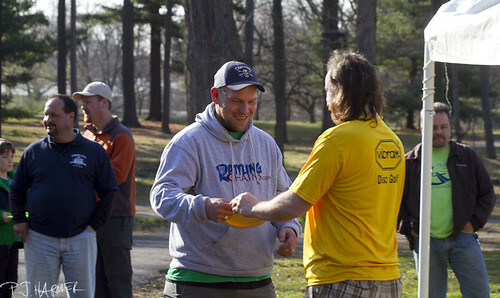 Bob is a member of Team Vibram and runs some great tournaments and they have always been fun. In fact, he always emphasizes fun, which is something I really respect about him. He’s always smiling and always willing to give a helping tip or hand. This tournament was no exception. However, it made me realize how hard this quest for 700 was going to be. I’m not sure if the “hacker” term is used in disc golf as it is in ball golf, but it sure fits the bill for me. Trees cringed when I stepped to the tee. Baskets laughed at me when I attempted to float one in. And I swear I could hear blades of grass in the distance of long holes making fun of me, as if they knew my disc would never land anywhere near them. The disc golf Gods were not smiling on me, that’s for sure! Par for the day was 55. I went 69-75 — and I thought I played better in the second round. Maybe I was more relaxed. Who knows. But when the scored were added, I was shocked. The first round was an interesting one for a couple of reasons. One, I had been working on 2 1/2 hours of sleep, which came before the 2 1/2-hour ride to New Jersey to play. Second, Darren and I were teamed up with two others who I knew through the magic of Twitter and members of the #hashtaggers fantasty disc golf league. Alex and Andy are local to that area, so they were both playing. It was cool to be paired up with them and get a round in. Despite some frustration at times (who doesn’t get frustrated? ), I enjoyed the round and had a whole heap of fun. But I was all over. When I say all over, I’m not kidding. Left, right, and up. By up I mean the disc goes floating way to high, catches wind and drops. It’s not impressive to throw a 100-foot drive, I assure you. There were three field holes, too. I dread these holes. They are long and difficult for me. It’s even worse when watching Darren, Alex and Andy all throw solid drives. And then it takes me two throws to catch up. At least it would appear I played in groups and gave some of my Irish luck away. Or so I can believe. 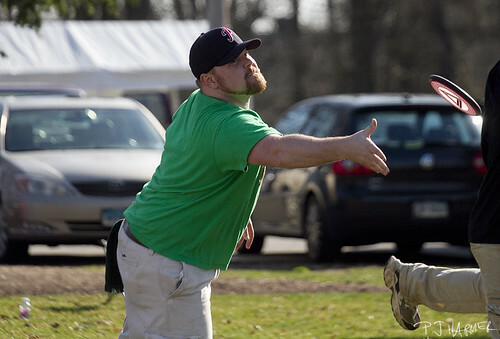 Andy, shown here participating in the Ring of Fire, placed second to Darren in Am 3. Darren won at Am 3, representing Rattling Chains very well. Andy placed second to Darren. Alex lost in a playoff for the Am 1 title. And in the second round, I played with the guy who won a playoff to win Am 4. At least I got to watch some decent disc golf. Not all was bad. I felt my putting was pretty decent throughout the day. I had some shots that made me smile. Heck, it’s the little things that keep you coming back, yeah? It’s the second year I played in this tournament and I’ve enjoyed it each year. I didn’t finish DFL this time around, so that’s a bonus. And there’s always a lot of fun things and people to chat with. That’s what this game is all about, isn’t it? Having fun? One of the most interesting part is Dennis — a local player who dresses up as a leprechaun each year. He’s also in a band and performs some fun songs after the event ends. I’ve attached a video below so you can all check out Dennis crooning away after the event. In the end, I hope my quest for 700 takes a step up. My two rounds were rated 739 and 662. I’m not sure what that will do to my overall rating, but hopefully it will go up. It’s a slow climb, but I’m staring 700 in the face. P.J. 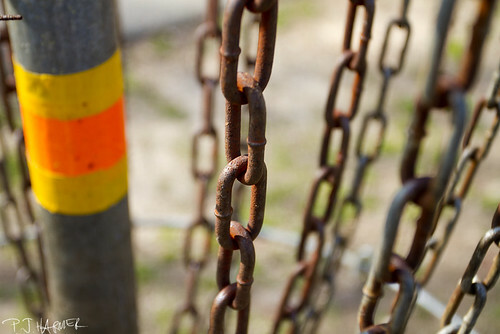 Harmer is the lead blogger for Rattling Chains. If you have any comments, questions, thoughts, ideas or anything else, feel free to e-mail me and the crew at: pj [at] rattlingchains.com. Don’t forget to follow us on Twitterand like us on Facebook! ← Poll 3: What other sports do you play? You’ll get to 700 man. Just keep on keepin’ on. the two rounds you played were 739+662=1401 congrats!! that’s a 700.5 rating average! cue “the Jefferson’s” cause you moving on up!! In other words the goal was met. 🙂 keep it up and before you know it things will come easy. Keep it positive!! But the goal is to get to a 700 rating overall, not just in a tournament. Not sure what my overall will be. But it’s good to know that the rounds are above my current rating!! In time, for sure. And I look forward to improving and working on things. It’s all part of the game. I’ll get you yet, Aupps. Even if it takes the 135 Blizzard to do it! Been playing since ’86 and never finished in the Prizes. My longest drive ever was 325′. The only time I have ever won anything is at charity events when I collect the most donations for the event. But I play because I love the game. Now that you realize that no matter how hard you try or how much you practice you will only be so good or bad you can concentrate on having fun and making life long friends. It also sounds like you should start a local club and get cracking on building a local course. Even if it’s only a 9 hole course. That’s one dream you can make come true if you are willing to work at it. Kevin — I love that attitude and that’s what I have, for the most part. And fun, to me, is the biggest aspect for this game. I don’t care if I win things. I just want to be able to compete a little and feel happy with how things go. If that happens, I’ll be stoked! Plus, goals to get better will always keep me pushing forward! We have a semi-local club that kind of is part of our area. We had a course in the works, but it’s recently gone stagnant with some red tape and such. Hopefully at least a nine-hole course will come out if it. If not, me and the other person involved in this blog have been eying a place for a nine-hole course. It would be pretty short, but it would be nice because I’ve talked to some people in the community who think it could be a huge asset for the area. So hopefully something will come out of it! Darren is rocking the Rattling Chains.com gear! It looks great!!! Heck yeah. Positioning and brand placement!